W Debate: Who should be the women's basketball player of the year? 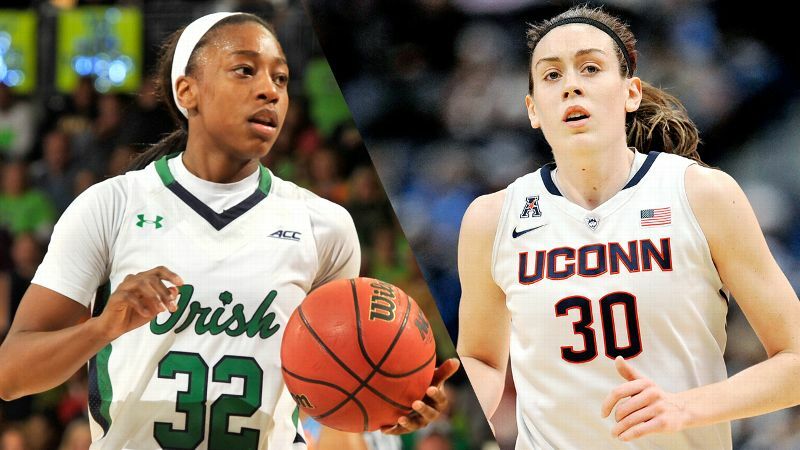 Who should be the women's basketball player of the year? not what we're talking about here. Eddie Redmayne recently won an Oscar as best actor. It doesn't mean voters consider him a better actor than his fellow nominees. What the vote concluded was that Redmayne's turn in "The Theory of Everything" was, in the eyes of voters, the best performance. If the college basketball season to this point was one extended drama, Jewell Loyd gave its outstanding performance. She had the most difficult role to play. She delivered the most powerful lines. Using admittedly subjective criteria, Breanna Stewart played four signature games: Stanford, Notre Dame, Duke and South Carolina. She played five more games against teams that might be favored, or at least on even footing, in first-round NCAA tournament games: DePaul, Green Bay and conference opponent USF on three occasions. And she played two games against Tulane, a potential double-digit NCAA tournament seed. Loyd played at least nine signature games: Connecticut, Duke (twice), Florida State (twice), Louisville, Maryland, North Carolina and Tennessee. She also played games against Chattanooga, DePaul, Syracuse -- teams that, like the second tier of Stewart's best opponents, could realistically win NCAA tournament games -- and against Quinnipiac. We can quibble over the equivalence of the teams above, but it's difficult to deny the volume. Loyd played more meaningful games and more of them against second-week NCAA tournament teams. Loyd played a more demanding role than Stewart did. That's not Stewart's fault, but it is to Loyd's credit. Notre Dame was 12-1 in those aforementioned games, and Loyd averaged 23.8 points, 5.8 rebounds and 3.2 assists and shot 48 percent from the field -- in each case equal or better to her season averages in all games. She was most productive in her most difficult games. And she did that for a team that surrounded her first and foremost not with two second-team All-Americans, as Stewart had in Kaleena Mosqueda-Lewis and Moriah Jefferson, but with a gifted freshman who might eventually be an All-American (Brianna Turner) and a sophomore point guard asked to be a scoring presence for the first time (Lindsay Allen). Yes, Notre Dame's lone loss amid that select group of games was against Connecticut, although Loyd's admittedly inefficient 31 points in defeat hardly paled in comparison to Stewart's contributions in that game. Yes, Notre Dame lost one more game than the Huskies, even though an ailing Loyd scored 27 points in that loss at Miami. And yes, although Loyd wasn't a liability by any stretch, Stewart's defensive presence was superior. All of those things matter, which is why a unanimous vote would not be an accurate reflection of the race. It should be a debate. It just isn't a debate about the best player in women's college basketball. Notre Dame's Jewell Loyd is a spectacular player, and I don't have a big quarrel with her being named espnW player of the year. I get it. However, my vote went to UConn's Breanna Stewart because I think she's an incomparable player at the college level. The closest comparison to Stewart in the WNBA is probably Elena Delle Donne. Like 6-foot-5 Delle Donne, 6-4 Stewart can handle the basketball, shoot from anywhere, pass with precision, run the floor, post up, rebound, protect the rim and be a team defensive anchor. Stewart also has the mind and body control that's a hallmark of UConn players who learn to play suffocating defense but avoid fouling. She has never fouled out of a college game. Stewart isn't the Huskies' top shot-blocker (that's Kiah Stokes with 132), but her tally of 85 blocks is indicative of her constant, forceful presence defensively. The arguments against Stewart as player of the year are not about her unquestionable talent or really even about performance. Instead, they're mostly about things over which Stewart has no control. Mainly, that UConn is stuck in the American Athletic Conference, which is not unlike Neil deGrasse Tyson being forced to compete in a high school science fair. But Notre Dame lost only one game in its conference. The Irish also face more challenges, and Loyd this year had more weight to carry with the departure of Kayla McBride and Natalie Achonwa. look at the head-to-head matchup of UConn and Notre Dame in December. The Huskies won 76-58 in South Bend, and Stewart had 15 points and nine rebounds. Loyd was the individual star, with 31 points. But how much of the defensive attention the Irish had to pay to Stewart helped contribute to teammate Morgan Tuck's 25 points? Or the good looks at the basket Kaleena Mosqueda-Lewis and Kia Nurse got? That's impossible to measure precisely, but it's a factor. In the Huskies' biggest marquee game, against then-No. 1 South Carolina, Stewart had 22 points, 8 rebounds and 5 blocks in UConn's decisive 87-62 win. You want a vintage Stewart game? The regular-season finale victory at South Florida: 29 points, 11 rebounds, 7 blocks. Because of her team's frequent dominance, Stewart really doesn't have the chance to put up many showcase games. But that was one, and you'll see more in the NCAA tournament.